As well as sending out sun lotion the foundation also wants to stimulate local production in the African countries. Through local production albinos no longer need to be dependant on donated bottles for the protection of their skin. 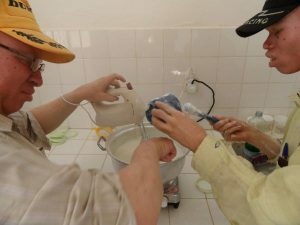 Stichting Afrikaanse Albinos supports a project in Mali and provides help to maintain this together with the stakeholders. The foundation also provides the raw materials. In Mali we support the Albino Association S.I.A.M. where the production has been set up in a laboratory at the Dermatological Institute Marchoux in Bamako. In 2013 and 2014 300 albinos in Mali were able to be provided with this sun lotion. In 2015 the African Albino Foundation started a project for local production. Rotary Leeuwarden-zuid has played an important part in enabling local production of sun lotion in the Ivory Coast. They have provided the African Albino Foundation with the capital needed to start up this project. With this money the project has been set up and the first colleagues are already trained and at work. The foundation started the first local projects in Malawi in 2008. In the Queen Elisabeth Central Hospital in Blanture a ‘skin clinic’ was set up in a laboratory where a totally independent production was achieved. This project continued successfully for a few years but unfortunately had to stop due to various circumstances.